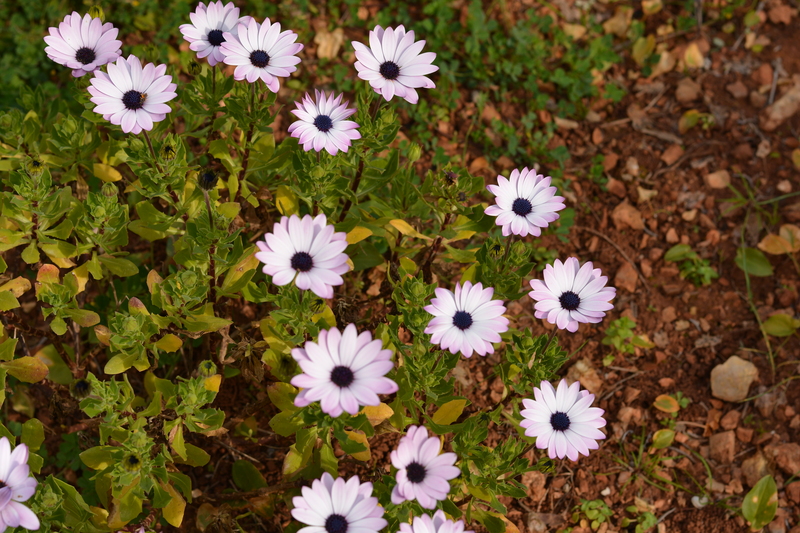 Osteospermum thriving in the stony soil of our garden. I’ve just had my annual garden centre splurge, buying some plants for our finca in the Mallorcan countryside. Garden centre visits were rather more frequent when we lived in the UK, where these tempting places are also open on Sundays and offer much more than the average jardinería on Mallorca. Many of the UK versions sell decorative items for the home and garden, and have a café where you can indulge yourself in a mid-shop stop for refreshments. In our early months of living on Mallorca, we were quite disappointed by the garden centres local to us – which were more like plant nurseries than those tempting places we knew in the UK. A favourite had been Burford Garden Company in the Cotswolds. Now that’s what I call a garden centre. We did manage to find some decent plants and some helpful assistants in our local places, and were hopeful that we’d have a good show of colourful flowers later in the spring. Little did we know . . . Within a week of planting our first purchases, there was nothing left to see. The rabbits – and there were many of them back then – had scoffed the lot! Since then we have become adopted by a family of feral cats (and a few feline hangers-on), and we have rarely seen any rabbits on our land. Can you blame them? We also discovered that our land isn’t suitable for many plants, being mainly rocky and with only a shallow layer of poor-quality soil. Typical Mediterranean plants do well, but other plants struggle. Succulents, cacti, lavenders, rosemary, and osteospermum are among those plants that do well on our land. The rabbit experience shaped our gardening habits. I started taking cuttings from existing plants, knowing that if the new plant died (or was eaten), it wouldn’t have cost us anything. Neighbours gave us ‘babies’ from their aloe veras and other succulents. I did invest in two climbing roses last year by mail order from David Austin; one quickly died, but the other is thriving. My recommendation for a good garden centre on Mallorca? It would have to be Fronda (formerly known as Magatzem Verd) in Palma (it’s just off the Via Cintura and with a smaller branch near the Fan Shopping Centre at Coll d’en Rebassa). It’s probably because the place is most like the garden centres we knew and loved back in the UK. Unusually, on Mallorca, it’s open on Sundays – although we never shop on this day of the week. It doesn’t yet have a cafe, but maybe one day? On Friday, I steered an enormous trolley around this garden centre, mentally spending a fortune on glorious colourful plants. In reality, it was just a few euros for the year’s new geraniums and herbs. We must have saved a fortune on plant purchases since moving to Mallorca . . . There are two Magatzem Verd in Palma. One off the Via Cintura and the other next to Carrefour in Coll d’en Rebassa. Yes, that’s correct, although We prefer the larger one off the Via. More like a Brit one, but without the cafe. I hope you’re well. Just wondered if you could help, we have recently bought an apartment in Santa Ponca and are struggling to find good terrace furniture, could you recommend anywhere? Perhaps the place in Manacor? Hi Debbie! Not sure if you have tried the Poligono Son Bugadelles? There are quite a few places there selling terrace furniture, including Knox Design, Casa Bruno, and others. Magatzem Verd in Palma (the large one just off the Via Cintura) also has quite a bit of it. Manacor is a big centre for furniture, but you shouldn’t need to come this far to find some. The new one recently opened in Manacor is this: http://www.llevantmobiliari.com. We have also bought stuff online from http://www.primrose.es – a well-established company on the mainland that delivers here. Hi Guy! Thanks for mentioning the Mimosa Garden Centre. I had forgotten all about that place, I must say, but you’re right, it’s very good. We haven’t been for a while (must rectify that soon) but did buy a lovely mirror in there for our guest bathroom, at a very reasonable price. Hope you enjoy your next visit! Ooh, Janet, thank you. We haven’t visited that one yet. It’s only recently started to look a bit smarter and the last time we passed I commented that we should check it out sometime. Definitely going to now! Thanks for that – and all the best in your new home. Thanks……….Very Nice & Interesting……Plz.Help me…..I am Looking for few Plants…..
1 is Gynura procumbens and 2.is Moringa.Thanks in advance. I wish I could help, but I’ve no idea about those plants. You could ask at Magatzem Verd in Palma, as they seem to stock a huge range? Thank you, Jamee, for reading my blog. Posted	 February 13, 2016 at 9:19 AM by Jamee Saleh.